Curriculum Assessment & Instructions supports FWCS’ Goal I, which is the achievement and maintenance of academic excellence. It supports the schools by providing a rigorous and relevant educational program. The FWCS curriculum includes challenging learning experiences with the depth and breadth so that all students can learn to high standards and acquire the skills they will need to succeed in life after high school. FWCS wants to ensure that all students graduate with high levels of academic achievement, so all courses lead to additional study or direct use in the workplace after graduation. This year, Fort Wayne Community Schools began using a new curriculum to increase the rigor of what students are learning and prepare students with the skills needed to be successful in life. These skills, known as the 6 Cs of global competency are: character, citizenship, collaboration, communication, creativity and critical thinking. Please check this page often for updated information and resources on how you can support your student. What are the 6 Cs of global competency? This information is a summary. For full information including full descriptions of all courses offered, please see the . Each freshman in FWCS takes a Career Information and Exploration course. In this course, students are guided through several activities to help them research and develop a meaningful six-year plan based on their own interests and aptitudes. As part of this course, students identify a career pathway. Specific courses for each pathway are identified to ensure students take courses which are relevant to them and which will provide the foundation for them to be successful in the career area they pursue. Students should use their Career Pathway Plan of Study course grid to select their high school courses. The Career Clusters and Pathways Grid illustrates the different courses of study available in the state of Indiana. Students must take math or physics in their junior or senior year. Notes: In addition to the course requirements listed above, students must also pass the Algebra I and English 10 End-of-Course Assessments (ECA) and take the ISTEP+: Biology end-of-course exam. Students in Fort Wayne Community Schools must have completed all graduation requirements in order to participate in commencement ceremonies. While student counselors are actively involved in assisting students and parents with course schedules and planning on a regular and ongoing basis, it is ultimately the student’s and parent’s responsibility to ensure that they are familiar with the requirements for the diploma they are seeking. FWCS’ mission is to educate all students to high standards, enabling them to become productive, responsible citizens. Our system to ensure that all students are successful is called the FWCS Pyramid for Success™. 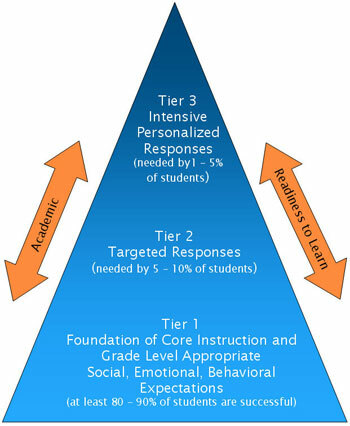 The Pyramid is composed of three tiers of supports that become more intense and personalized for students who need remediation or to be challenged further. Your middle school student may choose to take Algebra I, Geometry, Spanish, or French. These courses can earn one high school elective credit each of two semesters. You and your student decide whether or not to include the credit on the high school transcript. If you decide to include the credit, it will be counted in the grade point average and class rank throughout high school. It cannot be removed at a later date. While it meets post-high school requirements for Algebra and Geometry, it does not reduce the minimum number of math classes to be taken in high school. Algebra and Geometry classes count toward the math requirement for Core 40 and Academic Honors diplomas, but students must earn 6 additional math credits while enrolled in high school. Students must take math or physics during their junior or senior year for the Core 40 and Honors diplomas. Spanish and French meet post high school requirements and count toward the World Language requirement for all diplomas. If you and your student decide not to take the credit, the middle school transcript will show the course was taken but no credit appears on the high school transcript. The student may take the course again in high school or move to the next level of the course. Students wanting credit for the course must request the credit form from their high school counselor prior to the end of the sophomore year. The state of Indiana requires school districts to administer “multifaceted assessments” as a means of collecting and analyzing data to identify the educational needs of high ability students. Fort Wayne Community Schools meets this multifaceted assessment requirement through administration of the Cognitive Abilities Test (CogAT), the Scales for Identifying Gifted Students (SIGS) Inventory, and the IOWA Basic Skills Test for Reading and Math. Students in grades K, 2, 5, and select 8th grade students that are new to FWCS. Students in high school may self-refer or a parent may refer a student for testing. Additionally, students and parents new to Fort Wayne Community Schools may make a verbal or written request to the school’s principal. Parents of students who took the full battery CogAT assessment will be notified of their child’s testing results in May or at the beginning of the year in August. Schools will retain a copy of the child’s results in the student’s school record folder. Pathway 2: CogAT Standard Age Score Verbal Percentile of 80th-88th and score on the SIGS (Scales for Identifying Gifted Students) Teacher Form on Language Arts scale of 96th percentile or higher using general norms. Pathway 3: All information from Pathway 2 and an IOWA Basic Skills test score of 92nd percentile or higher. Pathway 2: CogAT Standard Age Score Quantitative/Nonverbal partial composite Percentile of 89th or higher. Pathway 3: CogAT Standard Age Score Quantitative or Quantitative/Nonverbal Percentile of 80th-88th and score on the SIGS Teacher Form on Math scale of 96th percentile or higher using general norms. Pathway 4: All information from Pathway 3 and an IOWA Basic Skills test score of 92nd percentile or higher. Accommodations will be made for students in accordance with the language written in their IEP’s. Please note that accommodations noted in a student’s IEP should be used only if doing so will not alter the nature of the ability the test is intended to measure. Accommodations will be made for students in accordance with the language written in their ILP’s. Please note that accommodations noted in a student’s ILP should be used only if doing so will not alter the nature of the ability the test is intended to measure. SBP is a cooperative relationship between IPFW and FWCS for students who wish to receive both high school credit and college credit from IPFW. These courses are taught in FWCS by FWCS teachers during the regular school day. To receive credit for the course, students must enroll in a special section of the course at their high school and pay $85/credit hour of tuition. Students who qualify for free/reduced lunch benefits are exempt from tuition and fees. Students will be billed directly by the university. SBP courses earn three to five college credit hours. High school students enrolled in SBP courses are admitted as non-degree-seeking students of IPFW. Any credit granted to a FWCS student participating in SBP will be recorded on an official IPFW transcript and will be fully accepted to satisfy degree requirements at IPFW. It is up to other universities to determine whether these credits will transfer to their institution. SBP courses vary by high school. Check with your student’s counselor to determine which courses are available in their high school. Advanced Placement is a college-level course taught by FWCS teachers who are certified by the College Board. Students receive high school credit and can also be eligible for college credit based on AP exam scores. Indiana Law now provides that students who earn a score of 3 or higher on an AP exam are eligible for college credit toward a degree, if the student attends any Indiana public institution of higher learning. The Indiana Department of Education currently pays 100% of the fee for math and science exams for ALL students. In addition, students who qualify for free or reduced lunch may take their exams without cost.